The heart of Asia celebrates its food, its culture and its progress toward culinary stardom. Imagine yourself sitting down at a favorite watering hole, thirsty for something that will not only quench your thirst, but will also heat up your metabolism as well as burn off some cholesterol. Your parched mouth opens and out comes a request for the bartender to produce his finest bottle of … vinegar. In the U.S., we'd do a double take and wonder why anyone would order a bottle of bad grapes. In Taiwan, flavored drinking-vinegar has become an extremely popular beverage among those 30 years old and older. I learned about Taiwan's drinking-vinegar among other things at Food Taipei 2011, an annual trade show organized by the Taiwan External Trade Development Council. The show, held every June in Taipei, boasts more than 1,100 vendors and 2,700 booths. Pai Chia Chen Brewery and Foods (www.pccv.com.tw), headquartered in Taibao City, was one of the first companies in Taiwan to create a drinking-vinegar and has been doing so for almost 25 years. The 39-year-old company has always had its hand in the vinegar market; however, upon realizing vinegar's many health benefits, it started to venture into the drinking-vinegar market. To the American palate, the thought of drinking vinegar may cause a puckering of the lips; however, the flavored beverage is far from the acidic one we're used to. Infused with fruity flavor notes, the vinegar offers a wine-like taste with all of the healthy benefits and none of the negative side effects. According to WebMD, drinking-vinegar reduces blood cholesterol levels and heart-disease risk; treats diabetes and may help control blood sugar levels; aids in weight loss; and may prevent cancer, osteoporosis and even aging. Pai Chia is using those health benefits to help its drinking-vinegar venture succeed. With 70 percent market share, it apparently is succeeding in Taiwan, in part because of mainland Chinese immigrants, who are aware of vinegar's health benefits. Other Asian cultures, such as Japan, Indonesia and Thailand, also use a lot of vinegar in their foods and are starting to use it more often in their beverages. "[Chinese] immigrants know vinegar's importance to the human body," says Michael Chiang, Pai Chia Chen director. This sentiment is something all food and beverage manufacturers across the globe can understand: "I don't know how many consumers realize food manufacturers aren't horrible people," says Jack Hsieh of Golden Crops Corp. (www.goldencrops.com.tw). "My family, my kids and I have all grown up on our products. In fact, I wouldn't manufacture something I wouldn't give to my own family. " Hsieh, whose company manufactures cereal ingredients, wishes more consumers knew how manufacturing, health, cost and food safety are intertwined. "Consumers need to understand that to get that 'healthy-looking' red apple, modifications are necessary. The same thing applies to making food more affordable. It doesn't happen without the help of ingredients." Right now, Golden Crops shows a good profit margin in the organics market. This is due to the niche market being more health-conscious and more educated about its food choices. "Education should be about prevention, not correction," says Hsieh. 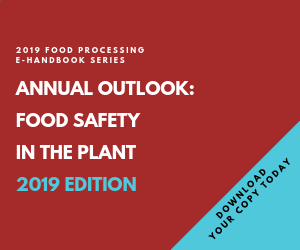 Food manufacturers, distributors, government agencies and consumers themselves have big parts to play when it comes to understanding food processing. Hsieh laments that it shouldn't be up to one group alone to understand how food and beverages are manufactured. Recent food safety scares are a testament how important this education is. When Taiwan officials discovered several sport and juice drinks, candies and health supplements had been tainted with diethylhexylphthalate (DEHP), a chemical that is said to increase the level of female hormone in men, an unprecedented number of food safety inspections were carried out in Taiwan. Hsieh uses this as an example as to why education – and labeling – are important for everyone when it comes to manufacturing and consuming food and beverages. Healthy food isn't just a product or a marketing slant to Fu Che Frozen Foods (www.fuche.com.tw), it's a lifestyle. The company set “natural food” as its core objective for product development beginning in 2005 and continues to use natural ingredients in its products. According to Director Lewis Tsai, health is important to everything the company does. Fu Che, which started as an egg processor in 1969, recently introduced revolutionary prepackaged convenience meals to the Taiwan market. The meals are geared toward the busy consumer interested in eating healthy meals without losing a lot of time to meal preparation. Fu Che's Good and Easy Cooking Pouches include all of the ingredients necessary to make traditional Asian cuisine with the only external ingredient being the meat of choice for the consumer. Safety is also a big concern for Fu Che. The company boasts the fact that every ingredient in the 19 varieties of prepackaged meals, from the fresh vegetables to the stock used in the sauces, has been tested and approved by Taiwan's Health Assn. To further its healthy food mission, Fu Che also includes food safety tips on each food package. Another Taiwan food manufacturer hoping to make cooking more enjoyable for Asian consumers is Chen Hsiang Foods. The company, which began in 1959, is most notable for soybeans, but is becoming known for specialty soup kits, which include a whole chicken and mushrooms but require no refrigeration. The soup kits, which retail for approximately 800 NTD (New Taiwanese Dollars) — or approximately US$27 — feed seven to eight people and can remain out in room temperature for several hours without refrigeration. This is particularly important in Asian cultures where meals – such as Chinese New Year – can last for many hours. According to Shu Fu, executive vice president of Chen Hsiang Foods, the company uses a special preserving technique for the chicken soups that removes bacteria before the soup mix is packaged. Decadence isn't something one associates with Asian culture, but after tasting some of Taiwan's sweet treasures, it should be taken into consideration. Pineapple cake, a treat that originated in Taiwan, encompasses a rich, buttery shortbread injected with sweet yet savory pineapple compote. The dessert is Taiwan at its sweetest and has become the mainstay of several Taiwan food manufacturers. Chimei (www.chimeifood.com.tw), a large Taiwan-based manufacturer, is using its success with its biggest exports — dumplings and pineapple cake — to introduce new desserts to the Asian market. It plans on introducing ready-to-eat cheesecake later this year. Shi Liang Lu Pastry, a small family-owned pastry manufacturer, also counts on pineapple cake for the lion’s share of its sales. However, its smaller size allows the company to make recipe changes, which it has done recently with some of its desserts. Based on consumer demand, the company recently switched to using more natural ingredients in all of its pastries. To most Americans, "Made in Taiwan" used to be synonymous with low-price products of questionable quality. However, the Taiwanese are working hard to change that reputation. With strict regulations for imports and exports, "Made in Taiwan" has become a selling point for many manufacturers who wish to differentiate themselves. American food & beverage manufacturers would be wise to look to Taiwan for its innovative ideas on educating consumers in addition to finding new and interesting functional ingredients. Novel foods and ingredients from Israel would do well here in the U.S. and Canada.